Since the European Election 2014 took place in May this year there were some slight changes in European politics. Especially the Green parties in Europe suffer under bad numbers in surveys, while the European Left is profiting from bad social conditions, especially in France and Southern European countries. Here are the current results of the eurometer. The christdemocratic EPP would get 28.5 per cent of the 751 European seats in EU-parliament in Strasbourg and Brussels. At the election EPP got 29.4 per cent. So the christdemocrats lost nearly one percent within two months throughout Europe. Especially the Polish government-parties PSL and PO (both EPP) are suffering, due to tape-gate. The Socialists of S&D reached 25.4 per cent in the last election in May. Today they would get 26.2 per cent. So they gained nearly one percent. Mainreason for this slide rise is a better performing Labour-party (as part of S&D) in the polls for the United Kingdom. Liberals ALDE and Conservatives ECR are fighting about the third position in Europe: Although ALDE rises from 8.9 to 9.9 per cent since May throughout Europe, they can not leave the Conservatives behind. They rise from 9.3 to the same level of 9.9 per cent. The Conservatives are pushed by strong results in Poland (PiS) where the main opposition party as part of the European Conservatives profits from the tape-gate of Polish EPP-government. In some European constituencies of Poland like Subcarpathian the party is at 57 per cent now. In summery European conservatives are on their highest level in European polls since 1984. In the countries of the EU that have not yet adopted the common currency, eurosceptic ECR would get 23 per cent of the votes. In May the European Left got their best results ever within a European election: 6.9 per cent of 751 European Parliament seats. Even now the party is booming in polls of different European countries: PdG in France, Podemos in Spain, and other European Left-parties rise in polls, so that the Left gets 8.0 per cent all over Europe. In the eurozone the party even rises up to 11.0 per cent on the third position behind EPP and S&D, in the countries that joined the EU in 1986 and 1981 the party reaches 22 per cent of the vote. The Left are the beneficiaries of the high unemployment in Southern European countries. One can not be sure if this rise will continue due to better numbers in unemployment statistics. If France’ economic will also get into a deeper crises the European Left might be the main beneficiary. One man’s meat is another man’s poisen: The European Greens are suffering a lot these days in Europe due to weak polls, especially in their former stronghold France: Reaching 6.7 per cent in the election in May, now the party declines to 5.3 per cent in polls on European level. The Populists of EFDD are traditionally strong in the time of European elections. Also this time they got 6.4 per cent of the European votes. After the election there was a rapid decline in the polls, especially in the United Kingdom for the UKIP party as part of EFDD. Now EFDD is at 4.9 throughout Europe. Mit der Entscheidung Jean-Claude Juncker zum de-facto Staatsoberhaupt der Europäischen Union zu wählen, sprechen die Spitzenpolitiker Europas den Bürgern aus der Seele. 78,8 Prozent hätten nach der Europawahl Jean-Claude Juncker (EPP) unterstützt. Bei der Wahl hatten die Sozialisten dem Christdemokraten die Unterstützung zugesagt und den eigenen Kandidaten Martin Schulz zurückgezogen. Auch die GRÜNEN und die Liberalen unterstützen den Kandidaten in weiten Teilen. Seine Herausforderer liegen weit abgeschlagen dahinter: Nigel Farage (EFDD) ist dabei mit 5,0 Prozent noch der Erfolgreichste. Gleichauf liegt die Kandidatin der Piraten Andersdotter. Die Kandidaten der Linken Mélénchon (2,5 Prozent) und Tsipras (3,8 Prozent) liegen abschlagen im Tal der Bedeutungslosigkeit. Teile der europäischen Linken unterstützen Juncker. Die Rechtspopulisten Le Pen und der Euroskeptiker Grillo liegen bei je 2,5 Prozent. Please vote in our poll, before you scroll down to read the latest article. Thank you for voting in Europeans largest presidency poll! Präsident der Europäischen Kommission wird wohl der Christdemokrat Jean-Claude Juncker. Wunschkandidat der Europäer wäre aber ein anderer gewesen: Martin Schulz (Sozialisten) hat europaweit hohe Zustimmungswerte von durchschnittlich 40 Prozent. Damit verdoppelt er im Monat der Europawahl sein Ergebnis verglichen mit April. Der designierte Präsident der EU Juncker liegt mit nur 9 Prozent (+3) sogar noch hinter dem Kandidaten der Linken Tsipras, der 14 Prozent (-3) erhält. Tspiras profitiert einerseits davon, dass er der einzige pro-Europäer ist, der radikale Veränderungen insbesondere in Bezug auf die Sparpolitik fordert, andererseits verliert er im Monat des heißen Wahlkampfes dadurch, dass er kaum in Nord- und Mitteleuropa präsent war. Nur in einer paneuropäischen Wahl-Show trat er auf. Christdemokrat Juncker wird sich das Vertrauen der Bürger noch erkämpfen müssen: Seinen höchsten Popularitätswert erreichte er im Monat März mit gerade einmal 13 Prozent. Ska Keller von den Grünen liegt gleich auf mit Juncker. Sie legt im Vergleich zum Vormonat fünf Prozentpunkte zu. Ihre Partei will in Teilen Juncker unterstützen. Überwältigender Verlierer in diesem Monat ist der Liberale Guy Verhofstadt. Er kracht von 38 Prozent auf nur noch 8 Prozent. Amelia Andersdotter Piraten haben im Wahlkampf schwach abgeschnitten. Die Spitzenkandidatin erreicht mit einem Popularitätswert von 6 Prozent (+3) allerdings ein Hoch. Nach ihrem Wahlsieg in Frankreich und anderen europäischen Ländern steht die Rechtspopulistin Marine Le Pen plötzlich bei 6 Prozent. Bislang rangierte sie in unserer Befragung europaweit stabil im nicht messbaren Bereich. Andere Kandidaten wie Europaskeptiker Nigel Farage erhalten 8 Prozent (-4). This month Guy Verhofstadt (Liberal-ALDE) is on the first position. He gets 38 per cent of all European valid votes (+31). Martin Schulz (Social-Democrats-PES) is loosing ground. 20 per cent (-18) would vote for him. Leftist candidate is on third position with 18 per cent (+2). New in the list is independent candidate Nigel Farage. 7 per cent (+7) of all Europeans would vote for him. Jean-Claude Juncker is scoring even more poor than last week. 6 per cent (-7) would vote for him. Green candidate Ska Keller would get 4 per cent. This means a huge loss of 12 per cent point compared to March 2014. Independent candidate Nicolai is Romanian. 4 per cent of all European would vote for her. PPEU-candidate Andersdotter would get 3 per cent (-1). Extreme right party contestant Wlosowicz (MELD) would get just 1 per cent (+1) of all valid European votes. Tzevelda told twittprognosis last month that she would not contest for presidency for MELD. Article about Spanish election prognosis: scroll down. Thank you for voting! Results of March 2014 EU-presidential poll here. In less than 50 days we will know exactly about the results of the European Parliament election 2014 #EP2014. Before this we want to introduce you the most important parties and their topical situation. Different from France, UK or Italy the Spanish democracy escaped populist parties although the financial crises since 2011 is very harsh and there is an enormous number of unemployed people. Some analysts assume that the reason behind this is the Franco-dictatorship, which was abolished just 40 years ago. The most popular party in Spain is still the ruling centre-right, christian-democratic party PP which will win 31 per cent (-11.7) of the votes in the European election (twittprognosis poll). The party is allied with pro-austerity EPP, which is the European party of Merkel’s CDU or Berlusconi’s FI. Leading candidate is Jean-Claude Juncker from Luxembourg. After the party started ruling under Rajoy in 2011, the party lost around 15 per cent. Seats for EPP from Spain: 17 (-6). Since the financial crises hit Spain while social-democratic-socialist PSOE was in power, the party is still suffering under poor results. 29.5 (-9.8) of the Spanish people would vote for the social-democratic-socialist party. It would be the weakest result for this party in European elections ever. The party is allied with European parties like British Labour or Hollande’s PS. Their common European party is PES under leading candidate Martin Schulz. Seats for PES from Spain: 17 (-4). The leftist-socialist IU got 3.8 per cent in the 2009 election. This time they will not just double their results: 12.0 per cent will vote for IU (twittprongosis poll). Under leading candidate Alexis Tsipras and his European party EL, the party is allied with GAUCHE from France and SYRIZA in Greece. Seats for EL from Spain: 7 (+5). Social-liberal party UPyD does not have an European partner organization. 7.5 per cent (+4.6) of the Spanish valid voters want to vote for this party in the upcoming European election. It would be the best election result for this party, which was founded in 2007. Seats for Independent from Spain: 4 (+3). The centre-right, liberal CEU is contesting for European party ALDE, which is allied with Dutch D66 or British LIBDEM. Common liberal candidate is Guy Verhofstadt. We predict about 4.0 per cent (-1.1) for CEU. Even MC is supporting Verhofstadt and ALDE. This party which was founded in 2005 would get 5.5 per cent (+5.4) of the votes. Seats for ALDE from Spain: 5 (+3). Green EdPV is contesting for EU-presidential candidate Ska Keller and José Bové in Spain for the European party EGP. We predict 3 per cent (+0.5) of the valid votes. Even many seperatist EFA-parties support EdPV. Seats for EGP from Spain: 2 (+1). Conservative Vox has not an European partner yet. Contesting the first time for European elections ever in 2014, we predict 4.5 per cent. Seats for Independent from Spain: 2 (+2). 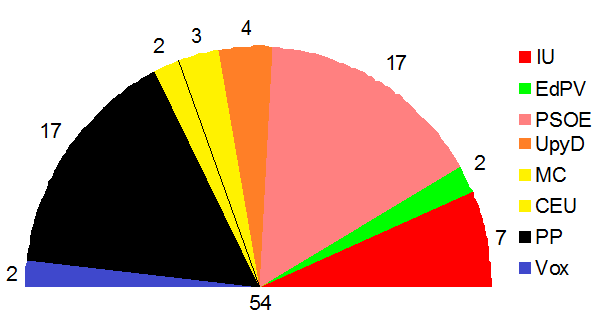 Combining UPyD and Vox you can see that the independent parties might get 6 (+5) seats of all 54 seats. Article about Italy election prognosis: scroll down. Thank you for voting! 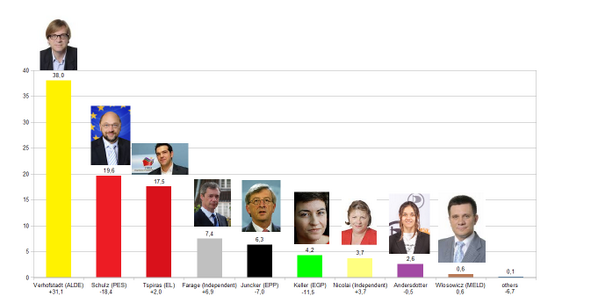 Results of March 2014 EU-presidential poll here. Typical for Italy, which is the forth most populated country in the EU, is a party system in which parties are disappearing and appearing frequently. Of the six big parties which are forecasted to get more valid votes than they need for negotiating the four-per-cent-threshold, four were founded after the 2009 European election. The Italians will elect 73 members of parliament. Like in France and Britain there are three big parties. Two of them are traditional: centre-right (F: UMP, UK: CONSERVATIVE) and centre-left (F: PS, UK: LABOUR); one of them is populist (F: FN, UK: UKIP) and was founded in the last years or grew more and more popular in the recent years. It is the same in Italy. The socialist-social-democratic PD is allied with the European party PES. The party of prime minister Matteo Renzi supports the candidat of the PES Martin Schulz. We are predicting 34.0 per cent (+7.9) for Renzi’s party. The party is still popular although it is in government since 2011 and handling with Italy’s financial crises. Allies of PD are e.g. the German SPD or the British Labour-party. Seats for PES from Italy: 27 (+4 compared to today). The second party is MS5 of comedian Beppe Grillo. The party is populist and has no party-alliance in Europe. Contesting the first time in history the party might get 24.5 per cent. 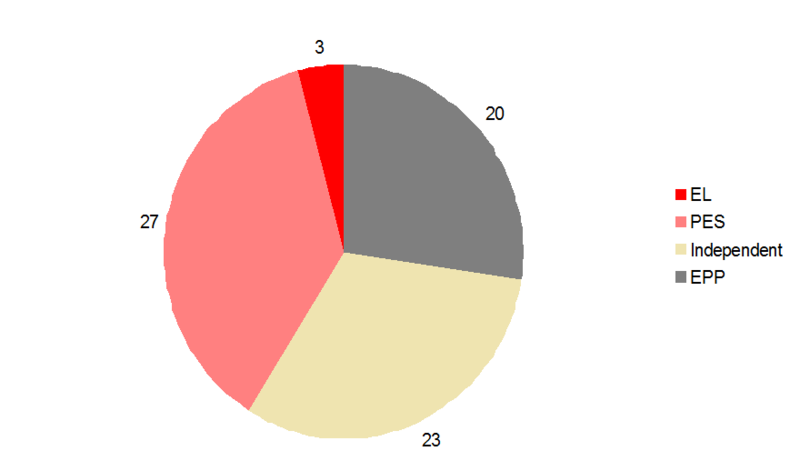 Different from the national election in 2013 (25.5%), Grillo’s party is not on the first position of all parties this time. Seats for Independent from Italy: 19 (+19). The party FI, which was founded last year, of former prime minister Silvio Berlusconi is supporting christian-democratic, centre-right-candidate Jean-Claude Juncker and his European party EPP in the 2014 European Election. Contesting the first time they might get 20.0 per cent of the votes. In 2009 Berlusconi was contesting with christian-democratic, centre-right PDL, which was dissolved in 2013. Their allies are Merkel’s CDU or the French UMP. Seats for EPP from Italy: 16 (-1). LN is the oldest existing party in Italy. The right-wing-populist party has no ally in Europe. We predict 5.5 per cent (-5.7). So the party will get just half of the 2009 election result. Seats for Independent from Italy: 4 (-3). The NCR-UDC is contesting for the EPP. European ally is Jean-Claude Juncker’s christian-democratic, centre-right EPP. NCR-UDC has allies like the German CDU/CSU of German prime minister Angela Merkel or Hungarian president Victor Orban’s FIDESZ. We predict 5.5 per cent. The party is contesting the first time for European parliament. Parts of NCR-UDC seperated from Berlusconi’s FI (former PDL), but on European level, they are still working together. Seats for EPP from Italy: 4 (-9). Socialist-leftist AET of Greek politican Alexis Tsipras will get 4.0 per cent. Supporting Tsipras candidature for the EL for European president AET is contesting the first time. Allies of the party are for example the German DIE LINKE and the Greek SYRIZA. Seats for EL from Italy: 3 (+3). The smaller parties like IdV, SVP or FDI, which have together 6 seats at the moment, will not get four per cent, so they will not get a seat in European parliament cause of four-per-cent-threshold. PDL and UDC were contesting in 2009, but are dissolved. If you summarize this one will see that PES will get 27 seats (+6), Independent will get 23 seats (+14) EPP will get 20 seats (-15 cp. 2009 election), EL will get 3 seats (+3). The ALDE will loose all their 7 seats.